Being an aircraft photographer is a challenging task but still, it draws the attention of many individuals. Aircraft photography is the art of capturing the phenomenal images of different types of planes, jets and the like. Every aircraft photographer possesses his own style of taking pictures. In-Ground Based photography includes taking pictures of static planes on the ground. This form of aircraft photography is considered the easiest because the aircraft is in a fixed position. It helps the aircraft photographer to cover all the details of the subject. Ground to Air photography is taking photographs of moving planes in the air while standing on the ground. This type of Aircraft photography is most commonly seen at Air Shows or Airport. Air to Air photography is the most demanding type of aircraft photography. Both the subject aircraft and the aircraft photographer are in the air. The airplane photographer is in the other aircraft. Auto Focus Mode: You need to set your DSLR to continuous focus mode. It is done to make sure that the focus remains continuously on the moving subject. Back Button Auto Focus Mode: To ensure effective shooting of the moving subject an aircraft photographer must use back button autofocus. It is used to constantly focus and adjust the focus on the moving subject. Most of the cameras ask the shutter button to focus and capture moving subject by default. Aircraft Exposure: Aircraft photography gets a little tough when shooting in the sky. Due to certain weather conditions, you may find it difficult to expose the aircraft properly. Give all your focus to expose the aircraft properly without bothering about the sky. Use center-weighted or spot metering system by adjusting the exposure to find the spot you wish to capture. Interesting Angles: What makes you a successful airplane photographer is how you showcase the creativity in your aircraft portrait. Capture your aircraft from different angles or a specific part of the aircraft. If you don’t like the angle delete it and try some other angles. Proper Usage of Light: Making use of light to your advantage is a very important part of aircraft photography. It is best to click aircraft photographs in the golden hour of the day when there is not too much of light or darkness. Learn to smartly deal with light and capture the best aircraft portrait. Equipment: Lens is the important equipment used for aircraft photography. You should have a fair idea about the different types of lenses used in aircraft photography. Then choose the one that meets most of your photography needs. Know How of the Location: Visiting a location prior to your aircraft photography shoot is helpful. Exploring the location would help you in knowing the opportunities and limitations before your aircraft photography session. 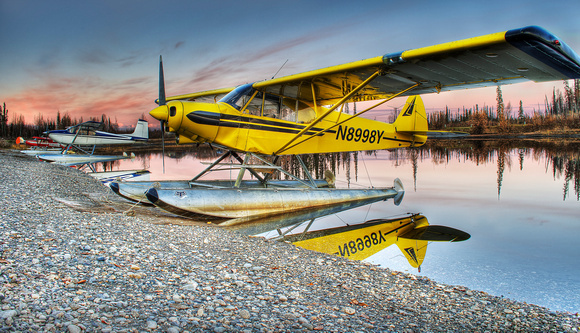 Alaskan photography is famous because the place offers some of the best locations for aircraft photography. Post Processing: Post-processing of the photographs is very necessary because you cannot rely solely upon out of the camera images. There are tools such as Adobe LightRoom and Photoshop to process your aircraft photographs. Check out for the best aircraft photography websites that give you the inspiration to become a successful aircraft photographer.